Like everyone else, elite investors make mistakes. Some of their top consensus picks, such as Amazon, Facebook and Alibaba, have not done well in Q4 due to various reasons. Nevertheless, the data show elite investors’ consensus picks have done well on average over the long-term. The top 15 S&P 500 stocks among hedge funds at the end of September 2018 returned an average of 1% through March 15th whereas the S&P 500 Index ETF lost 2.2% during the same period. Because their consensus picks have done well, we pay attention to what elite funds think before doing extensive research on a stock. In this article, we take a closer look at Ameriprise Financial, Inc. (NYSE:AMP) from the perspective of those elite funds. Is Ameriprise Financial, Inc. (NYSE:AMP) undervalued? The best stock pickers are reducing their bets on the stock. The number of bullish hedge fund positions dropped by 1 in recent months. Our calculations also showed that AMP isn’t among the 30 most popular stocks among hedge funds. AMP was in 32 hedge funds’ portfolios at the end of the fourth quarter of 2018. 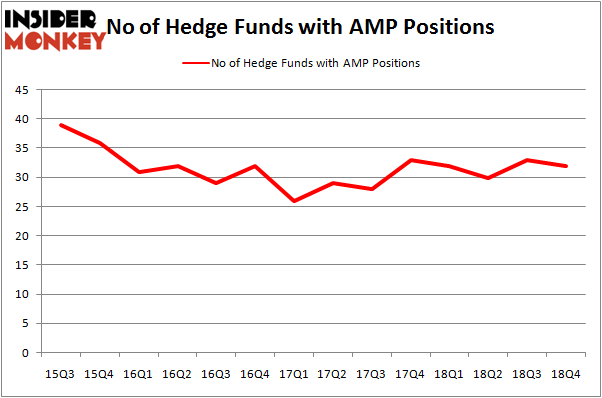 There were 33 hedge funds in our database with AMP positions at the end of the previous quarter. Let’s review the fresh hedge fund action encompassing Ameriprise Financial, Inc. (NYSE:AMP). How are hedge funds trading Ameriprise Financial, Inc. (NYSE:AMP)? At the end of the fourth quarter, a total of 32 of the hedge funds tracked by Insider Monkey were long this stock, a change of -3% from the previous quarter. On the other hand, there were a total of 32 hedge funds with a bullish position in AMP a year ago. 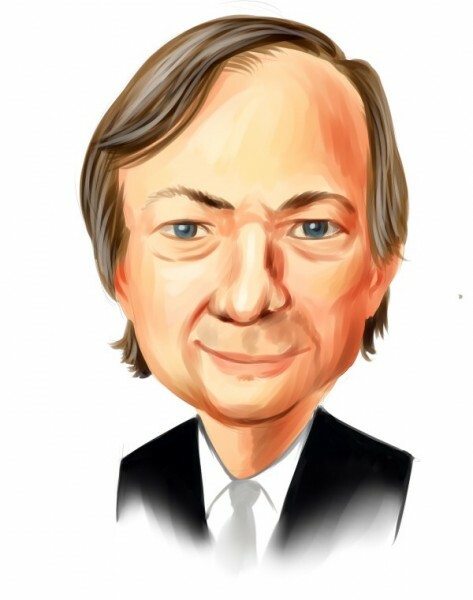 With hedge funds’ positions undergoing their usual ebb and flow, there exists a select group of notable hedge fund managers who were upping their stakes considerably (or already accumulated large positions). Among these funds, GLG Partners held the most valuable stake in Ameriprise Financial, Inc. (NYSE:AMP), which was worth $136.9 million at the end of the third quarter. On the second spot was AQR Capital Management which amassed $99 million worth of shares. Moreover, Arrowstreet Capital, Citadel Investment Group, and Two Sigma Advisors were also bullish on Ameriprise Financial, Inc. (NYSE:AMP), allocating a large percentage of their portfolios to this stock. Because Ameriprise Financial, Inc. (NYSE:AMP) has witnessed declining sentiment from hedge fund managers, it’s safe to say that there exists a select few funds that elected to cut their full holdings last quarter. At the top of the heap, Louis Bacon’s Moore Global Investments sold off the biggest position of all the hedgies tracked by Insider Monkey, valued at about $55.4 million in stock. Daniel Johnson’s fund, Gillson Capital, also dumped its stock, about $35.9 million worth. These bearish behaviors are important to note, as total hedge fund interest fell by 1 funds last quarter. Let’s now take a look at hedge fund activity in other stocks similar to Ameriprise Financial, Inc. (NYSE:AMP). These stocks are Ulta Beauty, Inc. (NASDAQ:ULTA), Markel Corporation (NYSE:MKL), First Republic Bank (NYSE:FRC), and International Flavors & Fragrances Inc (NYSE:IFF). This group of stocks’ market values resemble AMP’s market value. As you can see these stocks had an average of 25.5 hedge funds with bullish positions and the average amount invested in these stocks was $727 million. That figure was $555 million in AMP’s case. Ulta Beauty, Inc. (NASDAQ:ULTA) is the most popular stock in this table. On the other hand First Republic Bank (NYSE:FRC) is the least popular one with only 15 bullish hedge fund positions. Ameriprise Financial, Inc. (NYSE:AMP) is not the most popular stock in this group but hedge fund interest is still above average. This is a slightly positive signal but we’d rather spend our time researching stocks that hedge funds are piling on. Our calculations showed that top 15 most popular stocks among hedge funds returned 19.7% through March 15th and outperformed the S&P 500 ETF (SPY) by 6.6 percentage points. Hedge funds were also right about betting on AMP as the stock returned 24.5% and outperformed the market as well.